Lee Rocker of the Stray Cats said of his band's chemistry: "[It's] like we never stopped playing." There’s a short list of things the musical laymen of the world think of when they hear the word “rockabilly.” For most, it’s gravity-defying pompadours, head-to-toe leopard duds, Bettie Paige, and the Stray Cats. With a reputation-and more than 20-year history-preceding them, the Stray Cats, the band responsible for bringing rockabilly music to the masses, have decided to regroup and hit the road for a full-blown tour. 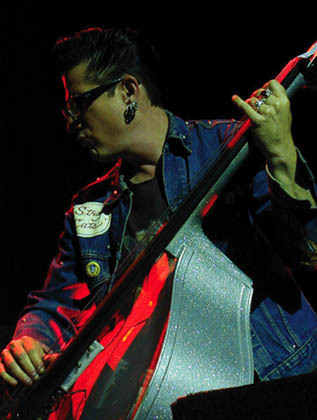 “It’s been a cool 15 years since we toured the States,” said bassist Lee Rocker. After years apart, a number of one-time-only appearances, and a European touring stint back in 2004, Brian Setzer, Rocker, and Slim Jim Phantom have found themselves on the road with the newly reformed Pretenders, ZZ Top, and a slew of special guests as part of the Jack FM Radio Show. On Friday, August 10, the Cats take to the stage at the Santa Barbara Bowl in a special, non-Jack sponsored, double bill with the Pretenders. So, does the return of the Stray Cats mean a rockabilly resurgence for the modern rock charts? While Rocker won’t confirm any plans to jump back into the studio with the Cats, he won’t deny them either. “We knocked out a couple of hits and let the chips fall. I’ve never been one to have big plans about what’s going to happen next,” he said. And as far as the scene is concerned, he’s hopeful. “There’s a real resurgence, I think. The scene is looking really good, judging from [the Hootenanny Festival in Orange County] starting in ’95. [Since then] it’s gotten bigger and new people are coming out every year. There’s some good young bands doing their own thing. Take Tiger Army and the Living End : they’ve made the sound theirs. [Rockabilly] shouldn’t be ’50s music. It shouldn’t have a date stamp on it,” Rocker explained. Retro-style throwbacks aside, the Stray Cats have a certain history behind them that draws audiences of all ages. And with the Pretenders along for the ride, the Cats’ Bowl show is steeped in modern American rock history. “It’s been fun working with the Pretenders. We know them back from our starting days. Chrissie Hynde was actually one of the first people to come out and see us play : [there’s] a lot of camaraderie,” Rocker said. And if happy bands make for good live shows, we should all prepare to have our town rocked.